The Imperial German Army pushes through Belgium intending to swing south into France. All that stands in the way is a small British Expeditionary Force. At the same time, the French Army strikes into the lost territory of Alsace-Lorraine driving the Germans back. Little do the French know it's a trap. 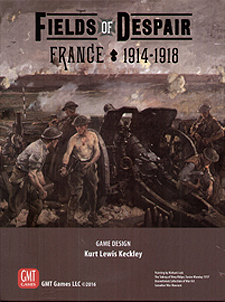 Fields of Despair is a two-player strategic block war game set on the Western Front of World War I. Players will relive the titanic clash of arms with scenarios covering 1914's fast-paced war of manoeuver, the stalemate of 1915-1916, and the breakout of 1917-1918. The Grand Campaign combines them all into an epic struggle. Fields of Despair introduces a unique block system that creates and maintains an intense fog of war while featuring every aspect of the conflict including dogfights and aerial reconnaissance, heavy artillery, the War at Sea, Eastern Front, poison gas, tanks, and Stosstruppen. A one of a kind solitaire system puts the player in command of the Allies in 1917 against an enemy that won't surrender easily. Play a fast-paced, wide open 1914 scenario before the trenches are dug, settle in a for a 1915-1916 chess match, or fight to the end of the Great War in 1917-1918. The choice is yours.